As far as villains go, they don't get much bigger, they don't get much badder than Darth Vader. As such, using him sparingly would seem to be a good idea for Disney as they expand the Star Wars universe, but...dammit, when the opportunity arises you just have to take it, and Rogue One: A Star Wars Story is too perfect a chance for Vader to make his return to the screen. Prepare to get the chills, because I certainly did. The new trailer for 'Rogue One' provides a look at many of the new faces that will be introduced. Felicity Jones as the most rebellious rebel of all, Jyn Orso, who we see in shackles initially. There's Diego Luna as Cassian Andor, Alan Tudyk voicing the enforcer droid K-2SO, Forest Whitaker as 'Clone Wars' veteran Saw Gerrera, Jiang Wen as assassin Baze Malbus, Ben Mendelsohn as Imperial officer Orson Kremnic, and perhaps most badass of all Donnie Yen as Chirrut Imwe, a blind warrior monk whose religion is the Force. 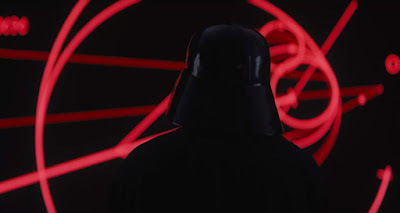 Since the storyline takes place just prior to the events of 1977's Star Wars: A New Hope, it opens up the door for certain characters to be brought back into the fold, and if you hang around until the very end you'll see the dark gloom of Vader. He's been pretty active over on Disney's Star Wars Rebels, too, so this is a good time for those rooting against those rebel scum. Forget all of the stories about the film's reshoots and Tony Gilroy taking over from director Gareth Edwards, none of that matters when the trailer is this cool. I'm not sure they can blow this one if they tried. We'll find out when Rogue One: A Star Wars Story opens December 16th.